Royal Enfield can perhaps lay claim to being the oldest motorcycle brand in the world, and have been producing their “modernised” single cylinder units since 1970. 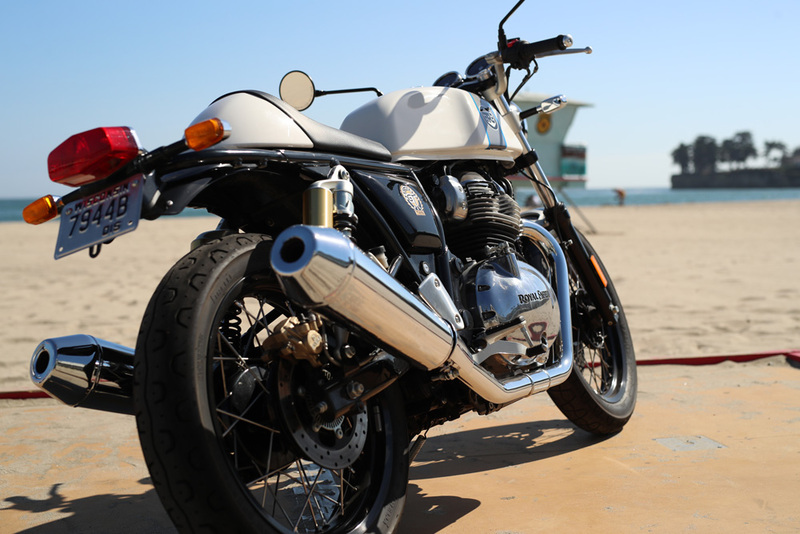 Give a warm welcome to their new offering based on a so-British vertical twin engine. 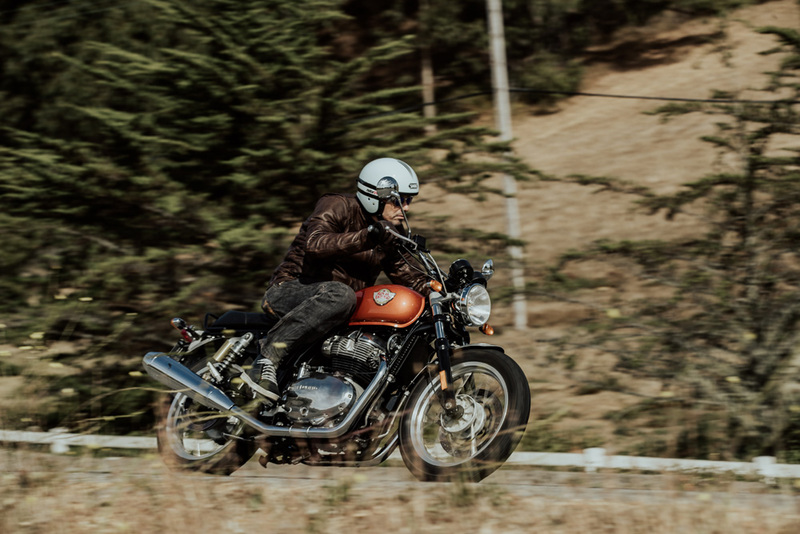 ZA Bikers went to Santa Cruz, California, USA, to test ride the brand new Royal Enfield 650 Interceptor and 650 Continental GT and found out that they are bloody good! The motorcycle legends aren’t supposed to die but Royal Enfield very nearly did. In the mid 2000’s, the brand was not iconic; just out-dated. The Chennai (India) factory was producing 18,000 units of a four-decades old Bullet, appealing to some faithful locals and a few manic foreigners and upsetting the biking community at large by the apparent lack of reliability and pre-historic technology. But hey! 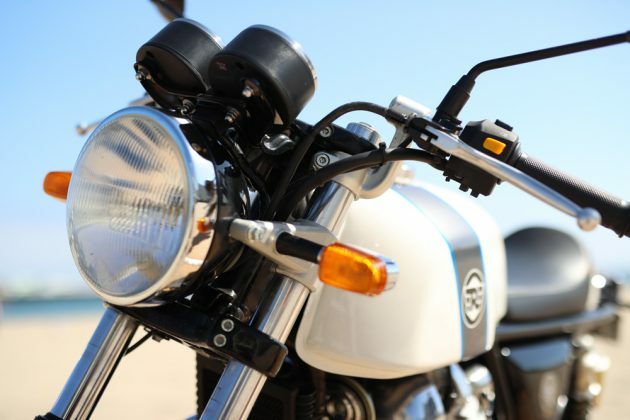 over the last financial year, they delivered 820,000 motorcycles, which suggests one of the best motorcycle resurrections ever! The single cylinder bike range (Bullet 350, Bullet & Classic 500, Himalayan 410) is now complemented by a brand new platform, based on a fresh and, yet so British, 648 cc vertical twin. With this new pair (Interceptor and Continental GT), Royal Enfield have some serious ambitions. Funny enough, no pricing, other than in the US, has been divulged during this world launch, but the company’s strategy is to be aggressive with pricing. 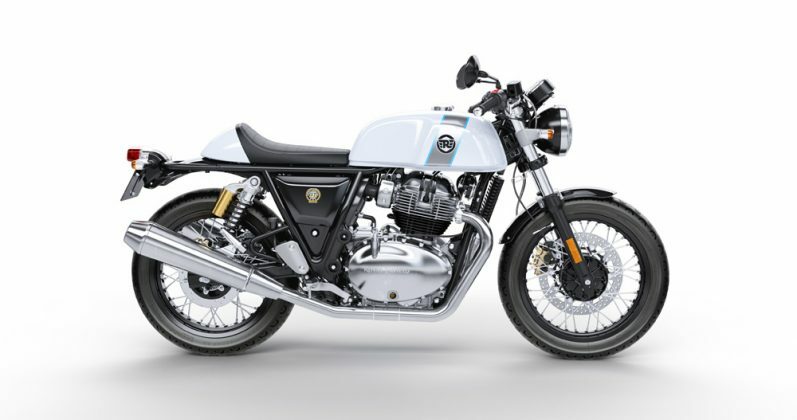 The Interceptor will start at as little as 6,799 $ and the Continental GT at 7,199 $, which puts the competition in a rather uncomfortable position, although the competition is also rather scarce. 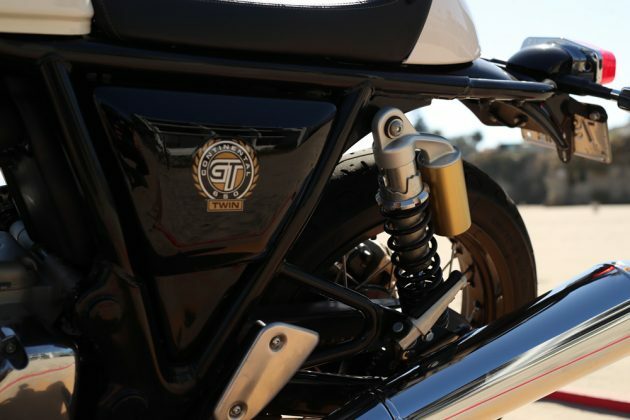 The Interceptor competes against the Triumph Street Twin and the Moto Guzzi V7 III Stone, and the Continental GT against the Triumph Street Cup and the Moto Guzzi V7 III Racer. Obviously, local South African pricing and availability has to still be announced. What we do know is that this won’t be before the beginning of 2019. 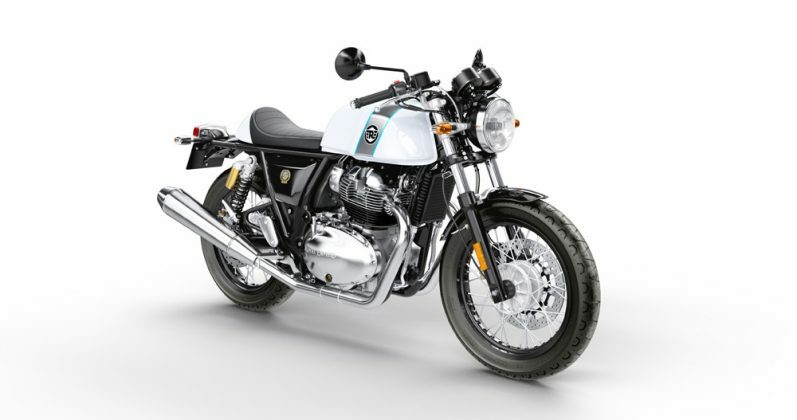 As a cherry on top of the cake, the 650 twins will come with a worldwide 3 year warranty! Royal Enfield is so obsessed by quality that they’ve built a batch equivalent to 5,000 machines that won’t be sold to customers, but rather used in testing to perfect their building process consistency. 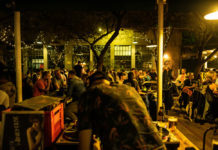 5,000 is a massive number and it shows the absolute commitment to getting the quality spot on. 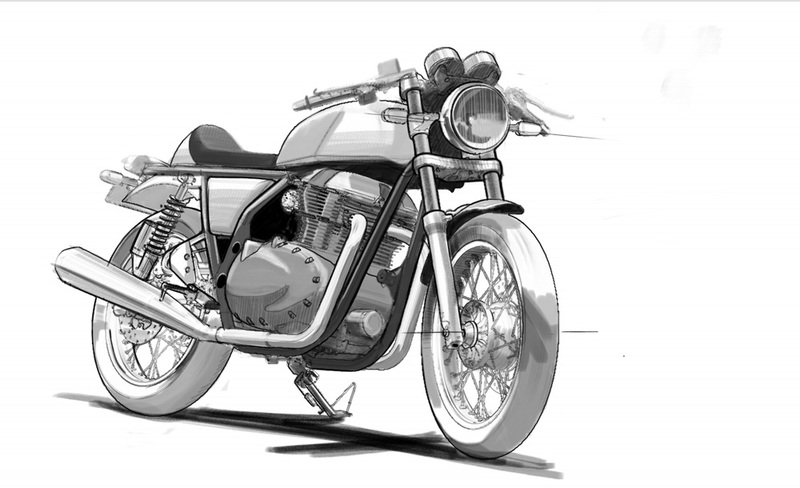 Royal Enfield is proud of its past and has even created a position for a genuine historian and fascinating story-teller, in the person of Gordon May. 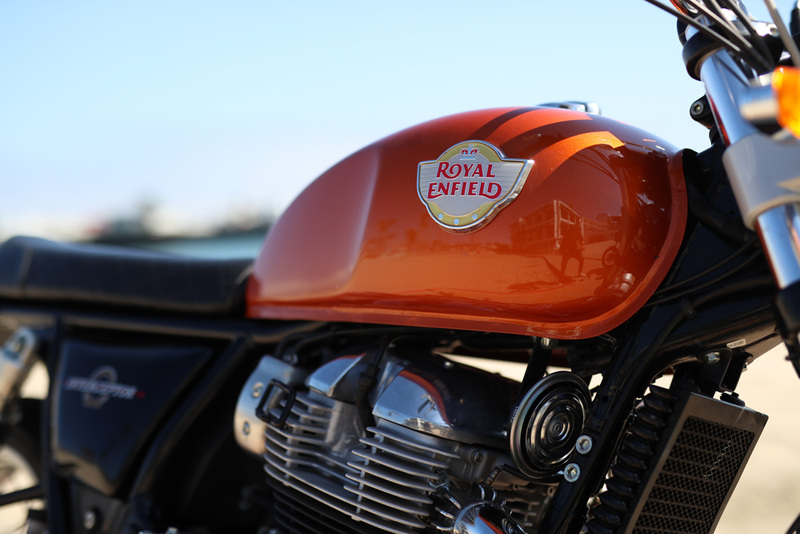 Gordon reminded us of the complex brand history, which is much more complex than the 1932 and onwards Bullet dynasty, which is too often associated to the British-then-Indian brand. 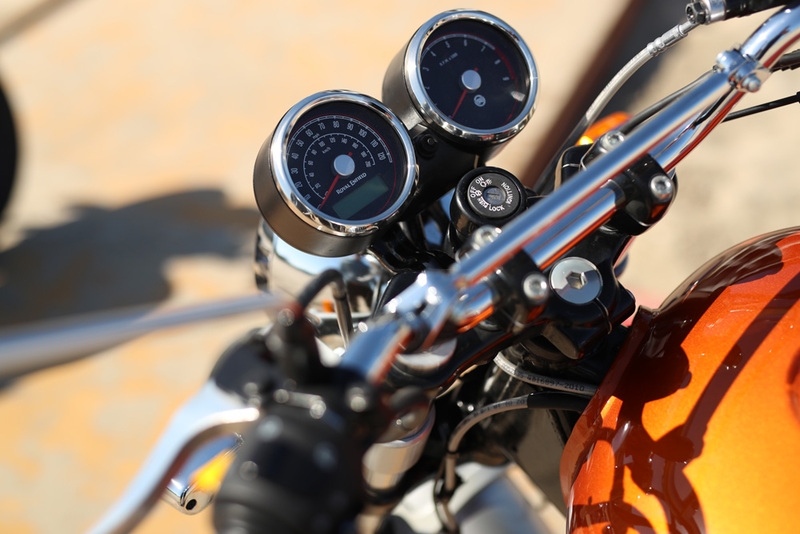 After the 2nd world war there were 200,000 motorcycles running in the USA. In the 60’s, the figure jumped to over 3 million, many of them being based in California. 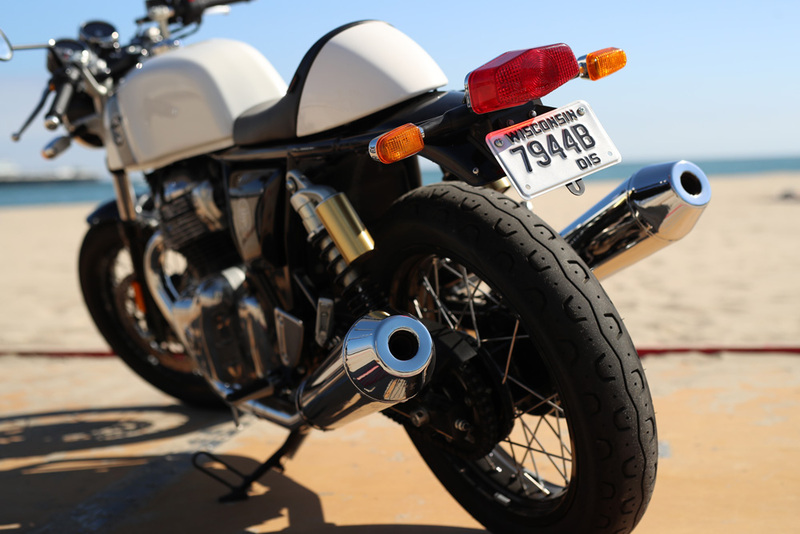 The British industry was then a great supplier of fun for the baby-boomers, and alongside Triumph, Norton and BSA, Royal Enfield took its share with the Interceptor. The Interceptor was a 650 vertical twin produced from 1960 to 1962, then followed by a 750 version (in reality: 736 cc), which was made up to 1970 when the British subsidiary of the brand collapsed forever. 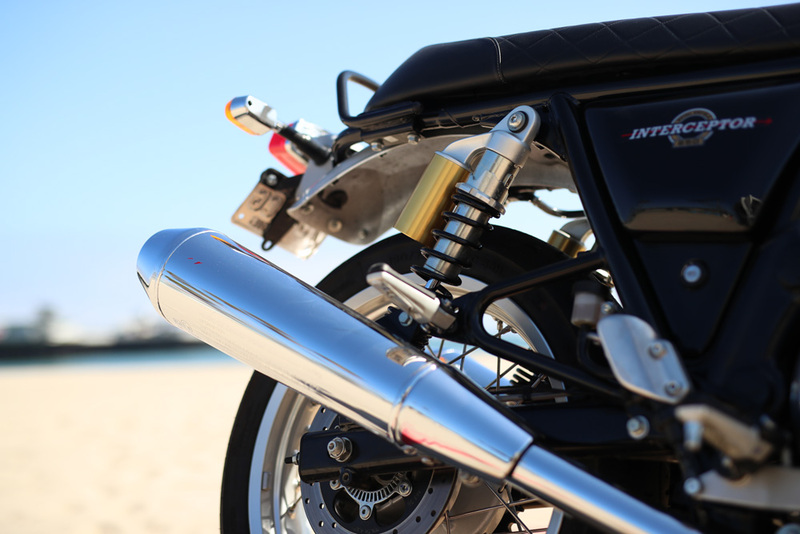 The Interceptor was a rather refined motorcycle, with a lot of mid-range torque. 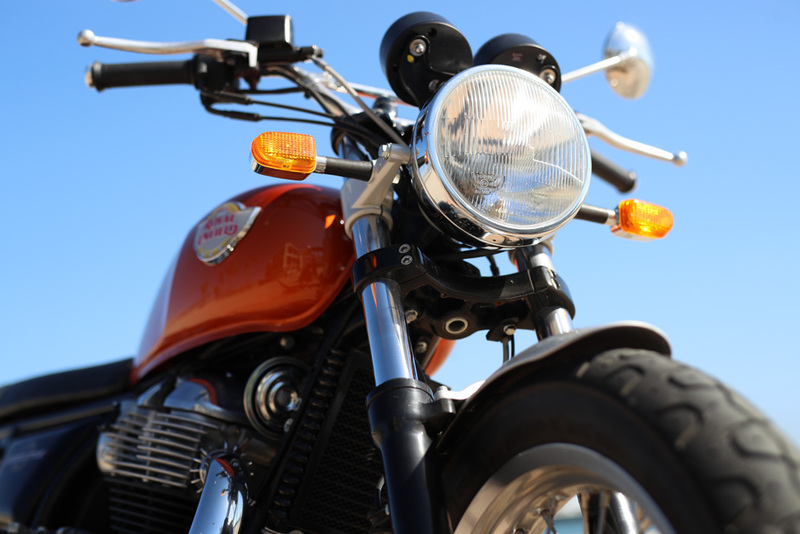 In the early 60’s, the British government put a limit to new bikers, by limiting them to motorcycles with a maximum of 250 cc engines! 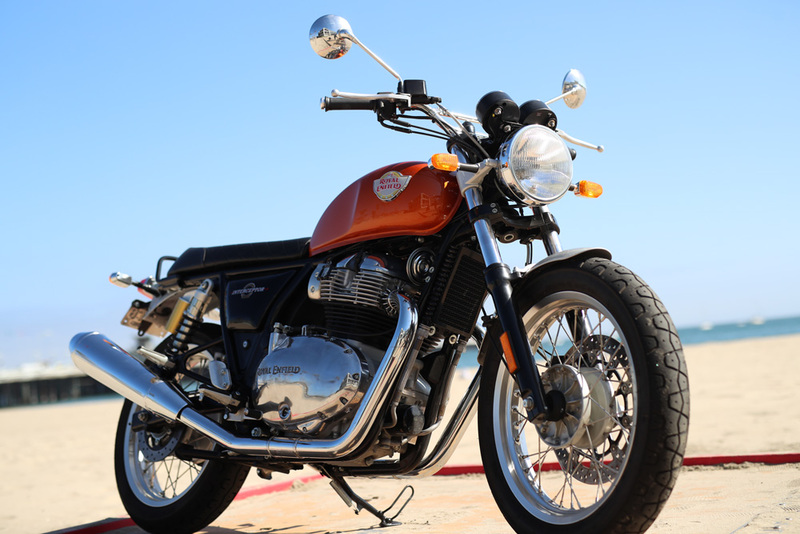 At the time, Royal Enfield had a commuter, the 250 Crusader. 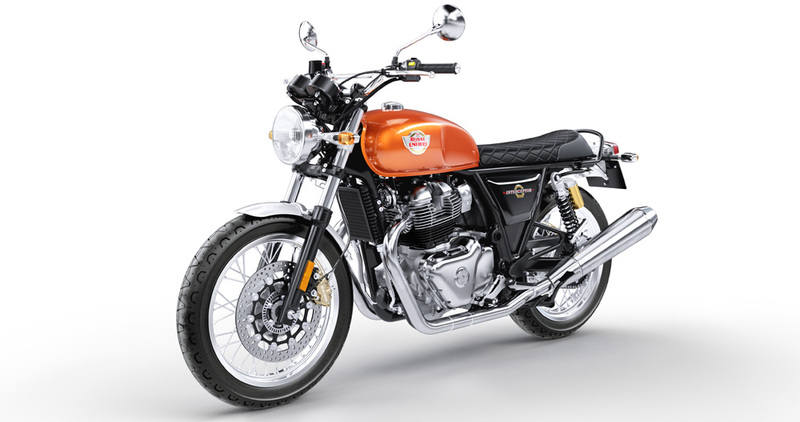 They improved it to make the Continental GT, which was in early 1965, the fastest (the top speed was over a genuine 135 km/h), the most sophisticated (it was the first British motorcycle to have a 5-speed gearbox) and also, the most expensive 250 cc of the time (at 270 British pounds, when a standard 250 was then costing between 200 and 220). 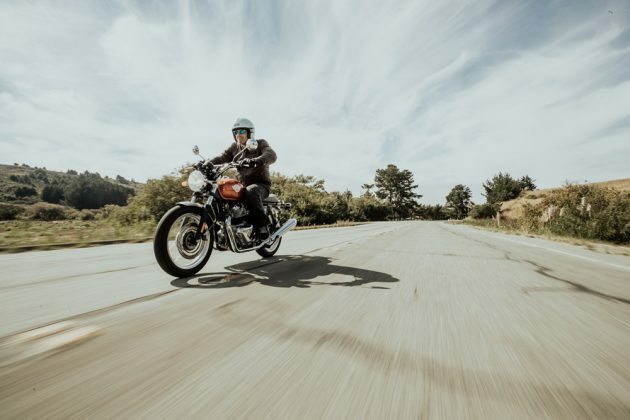 Royal Enfield proved the bike’s potential by organising a launch going from the furthest point North of Scotland to the furthest point West of Cornwall: the small 250 did the 1340 km of B-roads in one day without any trouble. 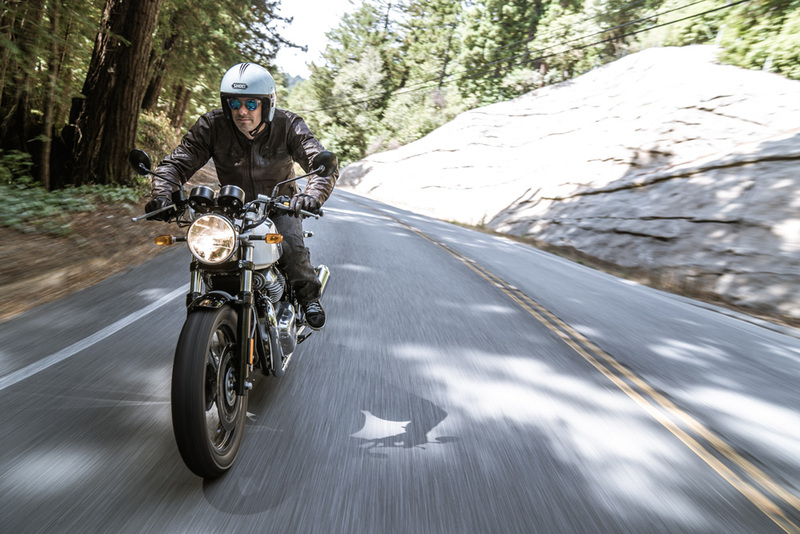 For 2019, the new 650’s are here to relive the past, the Interceptor in a rather direct heritage kind of way, whilst the Continental GT is just in keeping with its ancestor in spirit! 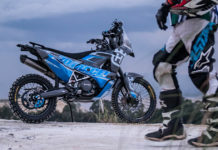 Although their designs are very distinctive, they share the same essential running gear, being different only in styling, ergonomics and the rear suspension settings. Interceptor and Continental GT share the same new engine. Gone is the time of the iconic, long stroke, 360° vertical twins. 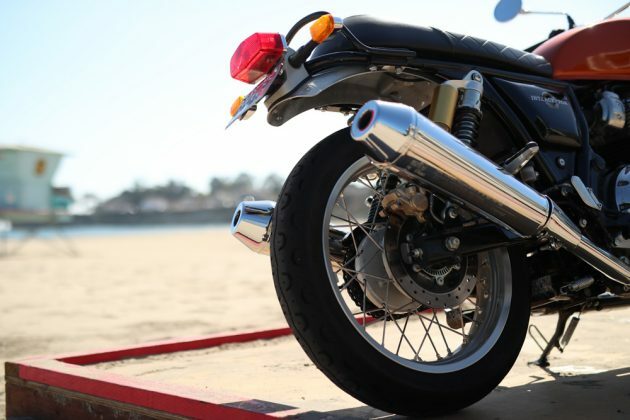 They were full of charm, for sure, but also full of vibrations, oil leaks, difficult to start and lacked true potential. 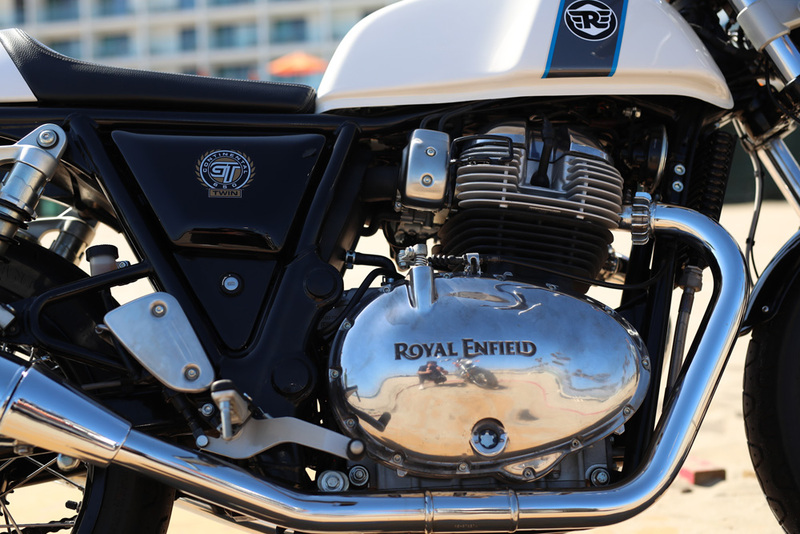 Royal Enfield made different prototypes of the engine and during a comparative test of 180°, 270° and 360° versions, the 270° unit came up trumps. 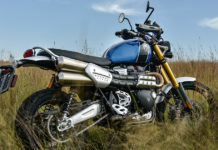 The engine is suitable for beginners and complies with A2 regulations: it delivers 47 hp @ 7,250 rpm and 52 Nm of torque @ 5,250 rpm (with 80 % of it being available from 2,500 rpm), and it doesn’t take long to be convinced by a broad spectrum of qualities. It sounds good, like a proper twin but fortunately not too loud. 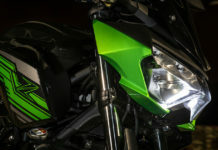 It’s smooth enough for daily use (you can ride at 60 km/h at 2,200 rpm in 6th with a smooth response, thanks to a nicely tuned Bosch fuel-injection), it’s quite lively around 4,500 rpm and the power delivery is sensitive between 5,000 and 7,000 rpm, although some vibrations are felt as the rev-needle goes higher and higher. 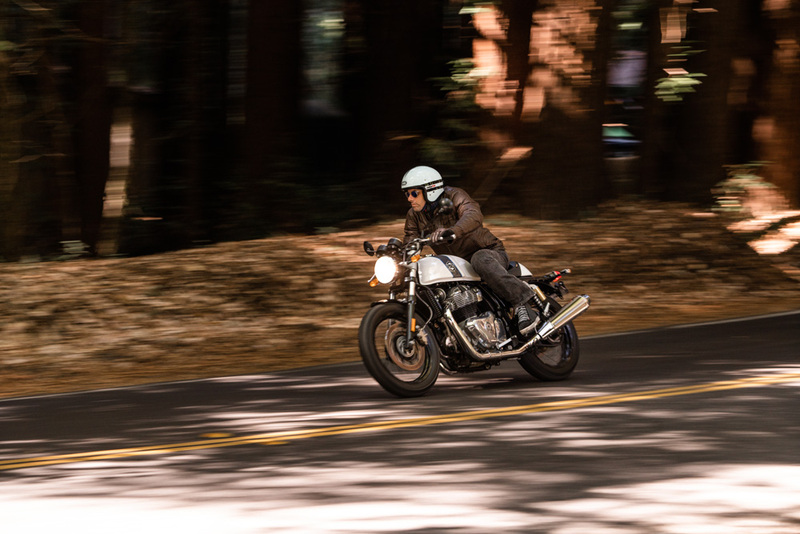 For commuting and B-road fun, the 650 twins are great. It does long distance too, as it’s running at 5,000 rpm at 120 km/h in 6th gear, in an effortless and vibration-free manner that makes the Bullet 500 an archaic, yet adorable, motorcycle! 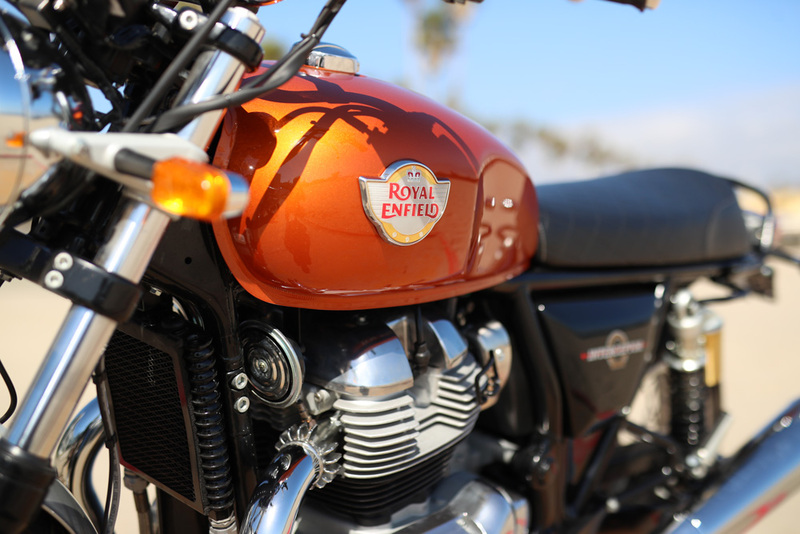 These Royal Enfields are now mile-eaters in an unprecedented way for the brand. 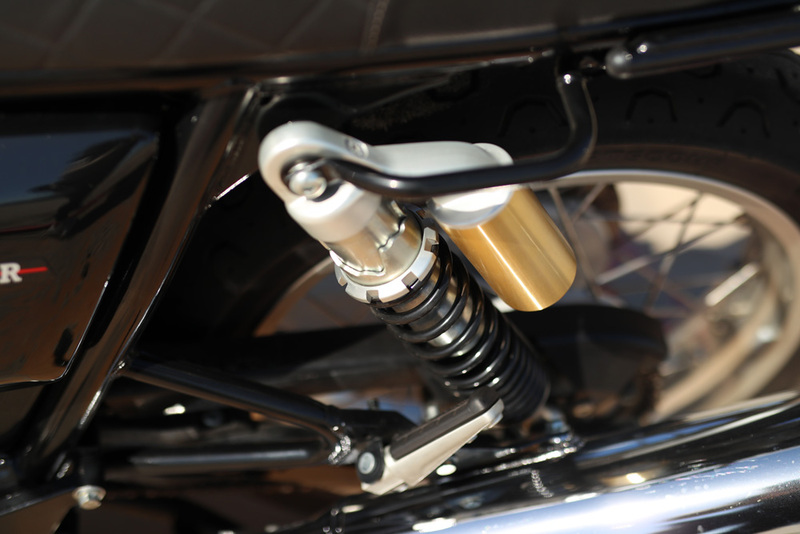 The Harris Performance company was bought a couple of years ago by Royal Enfield. Harris made some GP 500 frames in the mid-90’s and what they made for the 650 twins is just remarkable! Although the technology is rather simple (a steel, double cradle unit), the chassis gives instant confidence and a perfect balance. 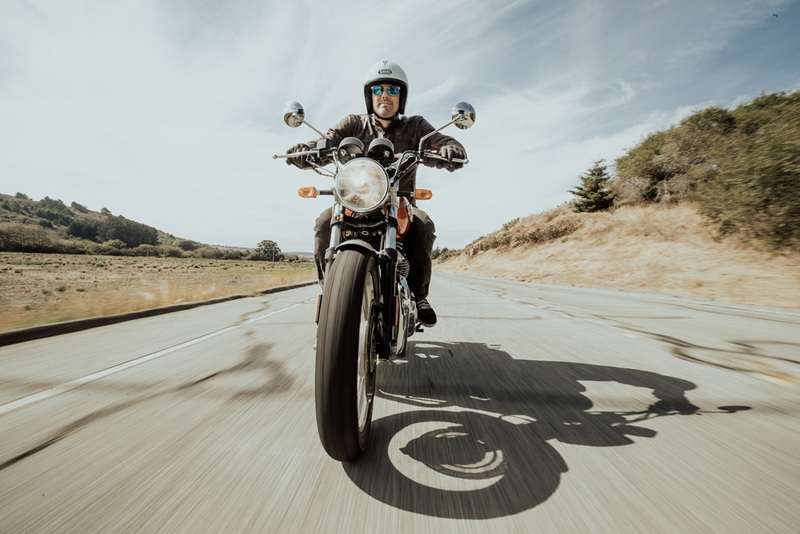 Ride them for a couple of hundred meters and you’ll definitely feel at home – as comfortable as sitting next to a fireplace, with your cat sleeping over your knees. When the pace gets faster, the bikes still impress with class-leading agility and real cornering confidence, with a planted front end and great ground-clearance. 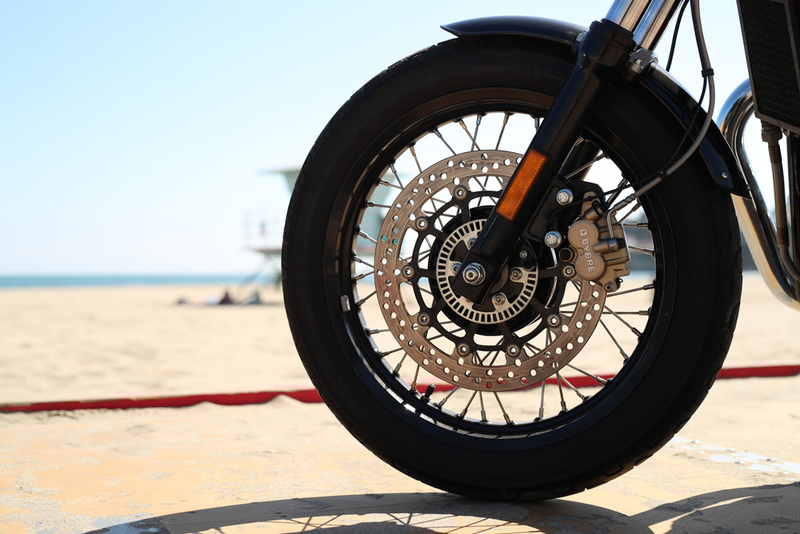 The Pirelli Phantom tires look old school, but their compound has been developed for the 650’s and they offer great grip and feedback. We’re not talking here about some superbike riding style, but a fast yet smooth pace in line with a modern classic. The brakes, made by ByBre (the Brembo low-cost branch) as used by KTM on some models, are good enough too. ABS is standard. 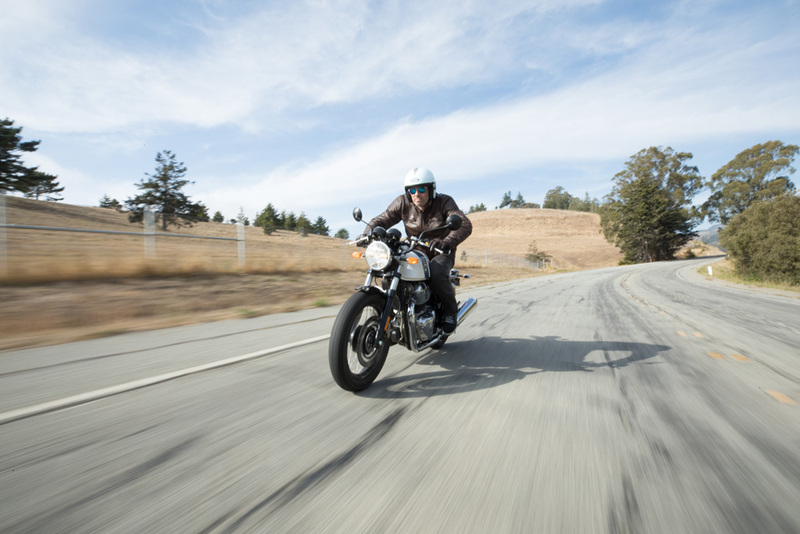 We started our first day of testing with the Continental GT and Royal Enfield was confident enough to take us down some very scenic and twisty roads, near the charming little town of Pescadero, surrounded by some dense forests of sequoia trees. 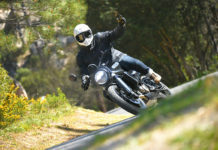 On those roads, the Continental GT seduces by its great agility and the confidence provided by its chassis and it’s more radical riding position (the foot pegs are 9 centimetres further to the rear than those on the Interceptor, and the handlebars 2 cm further and 4 cm lower), which gives a different riding experience. 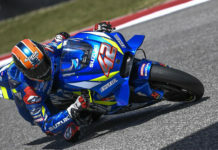 (Ask Jorge Lorenzo: a new ergonomic fuel tank helped him to win GP’s on the Ducati!). 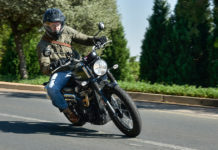 However, the riding position is far from extreme and the Continental GT proved itself to be a very comfortable machine, including the seat, which initially felt too firm but was actually fine. 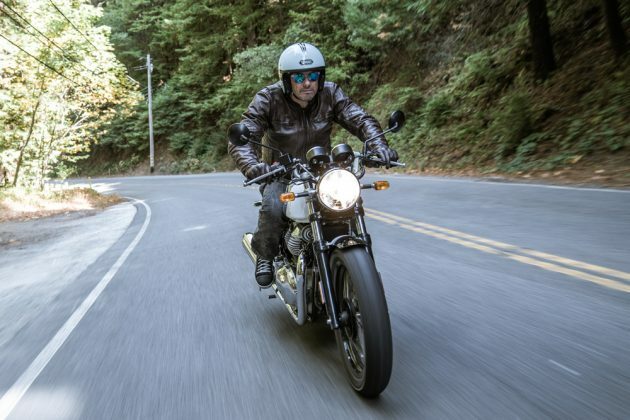 If the Continental GT is an easy bike to ride, the Interceptor is even easier. The natural riding position and its brilliant balance not only makes it a pleasure to ride, its makes it perfect as a commuter too. 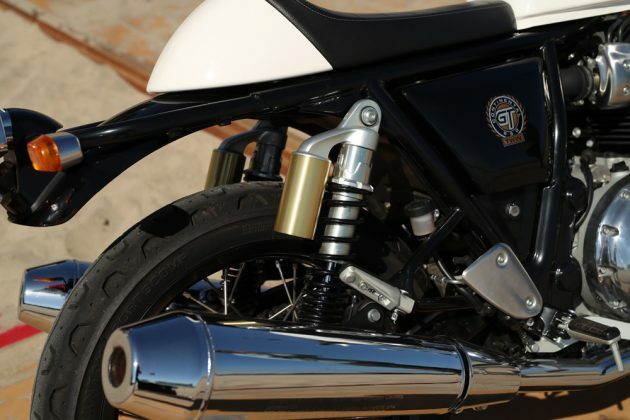 Both of them are nicely built: they’re not endowed with billet-machine parts and exotic components, but the overall level of finishes and assembly is more than decent, especially considering the pricing. 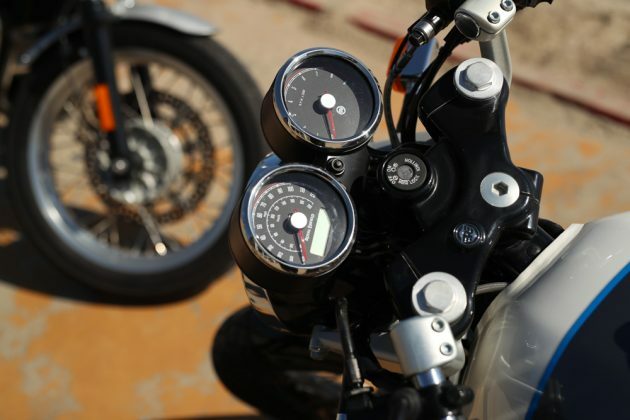 Your choice of which model will ultimately come down to personal preference, be that Cafe’ Racer or Classic Retro. 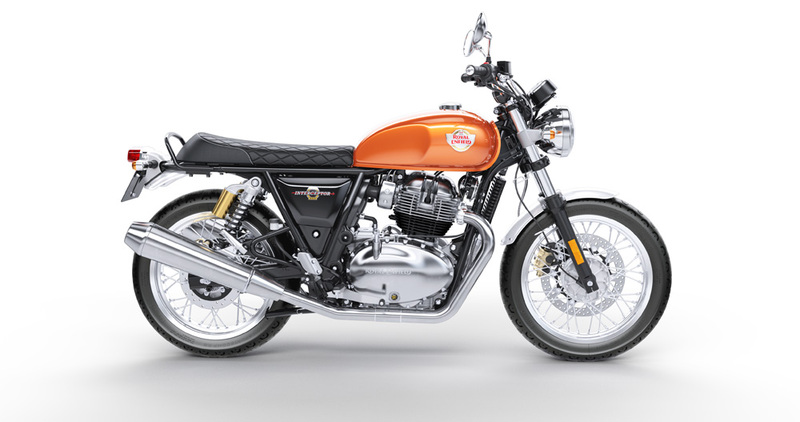 The two new 650 twins from Royal Enfield are a refreshing and worthy addition to the current crop of modern classics out there. In some hard to define and odd way, they seem the most “authentic” take on the original theme. 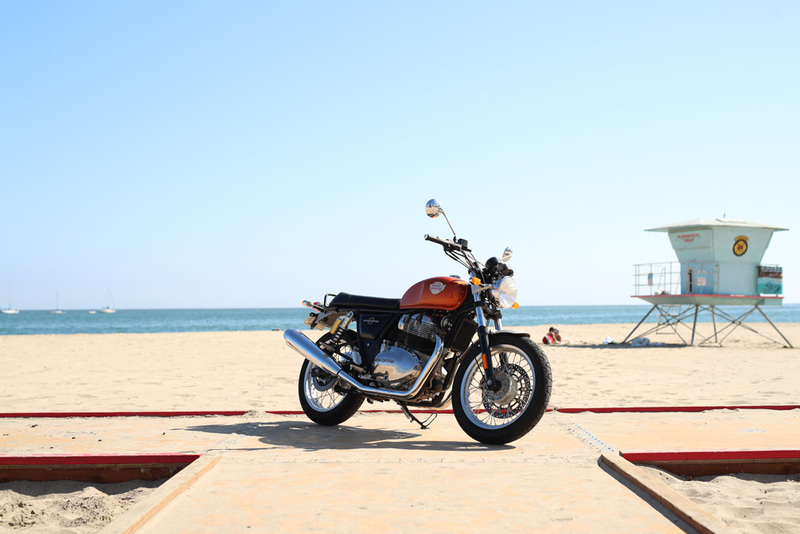 Ride one when you get the opportunity and see for yourself. 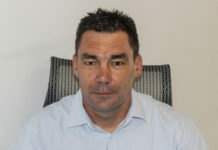 Frenchman Philippe Guillaume (locally known as “fearless Flippie” – a nickname given to him by oom Simon Fourie himself) has spent 8 years of his life living in Joburg. 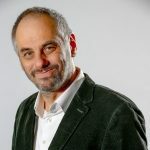 Phil is certainly the fastest geographer on earth: he holds a PhD in urban geography and a FIM Speed World record (5 135 km covered in 24 hours, at the Nardo oval track in Italy, on a Suzuki Hayabusa with the same set of Pirelli Angel ST tires).